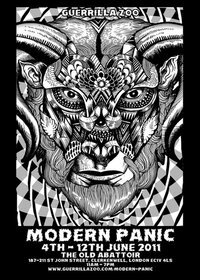 Once again it’s that time of year where the excellent Modern Panic art exhibition is on. As per before – I had the pleasure to attend the opening event and take photos there. I have a few friends that are exhibitors there. It’s a great show and I would highly advise taking a look. As well as the original art – some exhibitors have prints on sale. If I had a big house I’d buy so much from this show! Didn’t realise it before going but a few friends were exhibiting also – Ben Hopper and Esinem. On the opening night there were also a fair few performances randomly scattered around the place….. Oh of court when it’s about art it ‘s called “Space”. And it is fabulous “space” lovey darlings 😉 No really – it is. The place is called “The Old Abattoir” and I’ve seen other events being held there but never been before. No idea if it was a real abattoir or not. But it’s a wonderful mix of old walls, with or without plaster in various states, columns and pipes. Wonder if they do shoots there at all… hmm. Anyway – you can find out more details at these links. So some photos. Mostly of the exhibits/art but also people and performances. Click on them to see a larger image.